The art of functional medicine involves being able to spot key nutritional deficiencies and addressing them appropriately. As a clinician, I find that essential fatty acid and vitamin D deficiencies are two of the most common issues that are plaguing people’s health. I was quite surprised when I first had this test done that despite a diet rich in healthy fats, I was still deficient in essential fats. Post-testing after using high doses of EPA/DHA and GLA showed that I had returned to sufficient levels. Since then, I have found the appropriate dosage I need for optimal cellular sufficiency. The Bloodspot Fatty Acid Profile measures key Omega-3 and Omega-6 fatty acids and determines key signs to establish your ideal balance. Trans fatty acids—the “bad” oils in processed foods—are also measured. Individual fatty acids are measured as a percent of the total measurable fatty acids. Fatty acids are the fats we obtain from our diet. They may be monounsaturated, polyunsaturated or saturated. Fatty acids are found in oils and other fats that make up different foods. Balanced fatty acid levels are essential for ideal health. Chronic inflammation at the cellular and system level is the major underlying factor in all chronic disease. Fatty acids play a very critical role in cellular health as they make up the cell membrane and have an intimate role in the hormonal responses throughout the body. 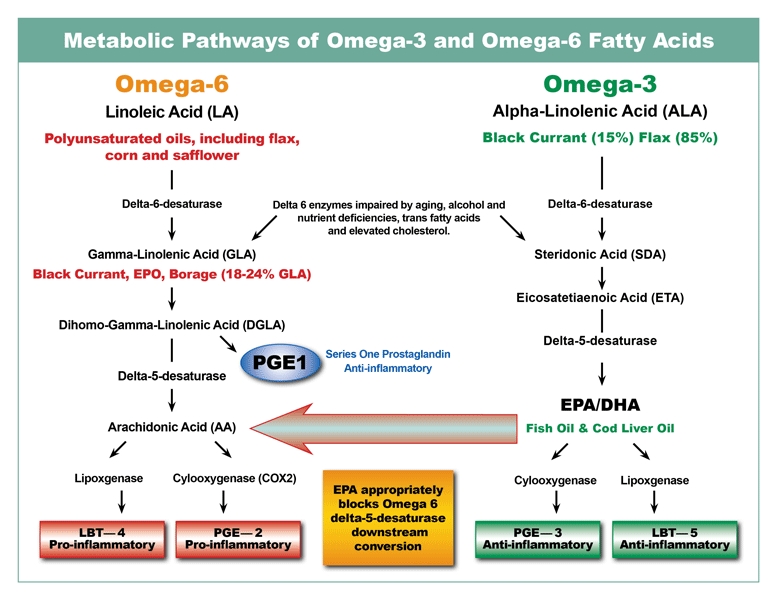 The ideal ratio of essential Omega 6 to Omega 3 fats is critical to cellular health and systemic inflammatory levels. Various researchers have found that the ideal ratio of Omega 6 to Omega 3 Essential Fatty Acids is anywhere between 2:1 – 4:1. The average westerner has a range around 16:1. This is due to diets that are high in commercialized meat and processed corn, soy, peanut, sunflower, cottonseed and canola oils. These foods are very high in Omega-6 fats and low in Omega-3 fats. (Hemp Seed Oil has a natural Omega 6 to Omega 3 ratio of 4:1). Research is clear that Omega-3 fatty acids are key for good cardiovascular health and brain function. They are also important for reducing symptoms of joint pain and immune dysfunction as seen in cancer and auto-immunity. 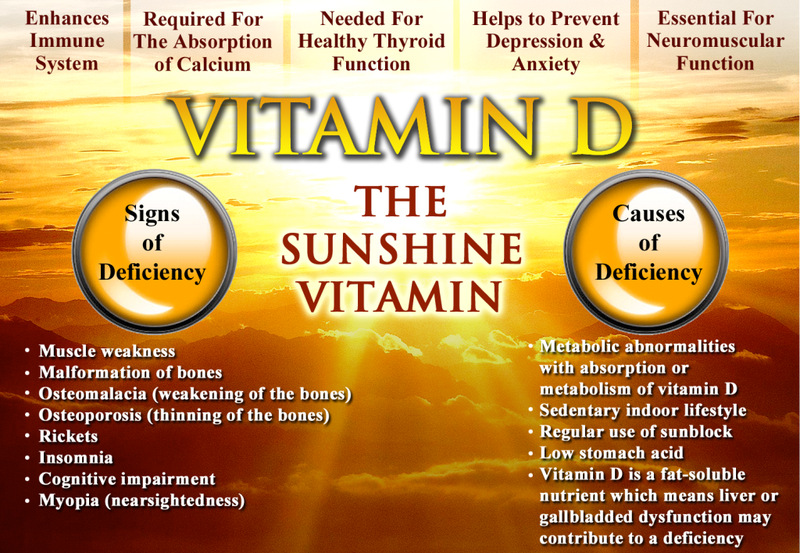 Vitamin D deficiency is a current epidemic in our society today affecting 90% of our world`s population. According to Vitamin D expert Michael Holick, “We estimate that vitamin D deficiency is the most common medical condition in the world”. It is clear that most people are not getting enough healthy sun exposure and vitamin D synthesis. Vitamin D is best known for promoting healthy calcium metabolism and bone health but researchers have found that it is critical for all systems of the body. A vitamin D deficiency will impact the development and stability of the immune system, the nervous system and the endocrine system. Vitamin D is known to play a central role in modulating the immune system and controlling inflammation. These are two vital processes that are tied to nearly every age-related disease condition. Vitamin D deficiencies are linked with an extraordinary amount of common health disorders. The major way we obtain vitamin D3 is through exposure to sunlight. However, most individuals in westernized countries are spending significantly less time outdoors and are not getting adequate sun exposure to produce sufficient levels of vitamin D3. Additionally, most individuals in North America are living in regions where they are unable to obtain sufficient sun exposure for anywhere from 4-8 months out of the year. Due to the lack of proper sun exposure for optimal vitamin D synthesis, many scientists now strongly advocate supplementing with doses that are considerably higher than the RDA minimums. Vitamin D more resembles a hormone than vitamin by function. Hormones are chemical messengers that interact with cell receptors to produce specific biological responses. Calcitriol, the active form of Vitamin D, is arguably the most powerful hormone in the body. It has the ability to activate over 1,000 genes which is roughly 5-10% of the human genome. Vitamin D3 levels are most often understated. In the medical world, levels below 32 ng/ml are considered insufficient. However, much research has shown this level is only sufficient to prevent the development of rickets but not sufficient enough for optimal function. 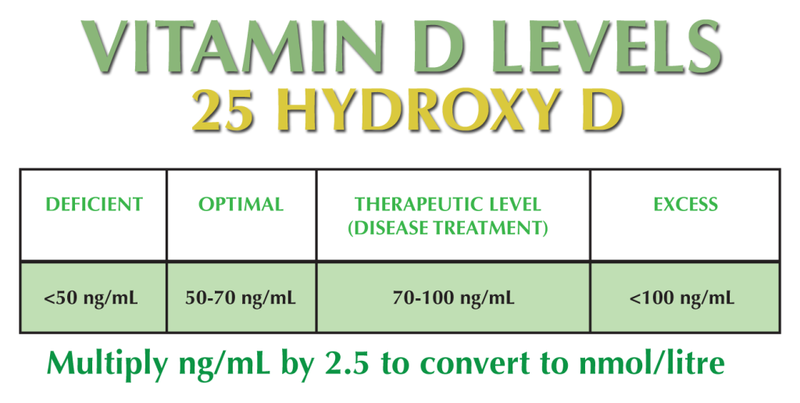 Maximized Living doctors use the following ranges for optimal vitamin D3 levels. Researchers believe that vitamin D3 acts to protect an aging brain and boost overall memory and cognitive function. This is thought to be done by increasing levels of protective antioxidants, increasing key hormones and suppressing a hyperactive immune system that can inflame the neurological circuitry. A 2009 study led by scientists at the University of Manchester in England, looked at vitamin D levels and cognitive performance in more than 3,100 men aged 40 to 79 in eight different countries across Europe. The data show that those people with lower vitamin D levels exhibited slower cognitive processing speed. There are vitamin D receptors throughout the central nervous system and critical regions of the brain including the hippocampus. Researchers have concluded that vitamin D activates and deactivates enzymes in the brain and cerebrospinal fluid that are involved in nerve growth, synaptic density and neurotransmitter synthesis. Vitamin D3 is also shown to boost glutathione production in the neuronal cells protecting them from damage inflicted by oxidative stress. Vitamin D also helps to modulate the immune system to reduce inflammation throughout the body. A 2010 study published in the Archives of Internal Medicine showed that those who are classified as deficient in vitamin D were 42% more likely to have cognitive impairment. Meanwhile, those classified as severely deficient were 394% more likely of having cognitive impairment. As a clinician, I see very serious health problems associated with long-term vitamin D3 deficiencies. This is one of the most critical tests anyone can possibly have done. Amino acids – What role do they play in muscle building, weight loss and fitness?